I see several alternative health practitioners. At all of them, in the winter, visitors are asked to remove outside footwear and slippers are provided. I don't mind taking off my boots or dirty shoes, and I really appreciate that slippers are available. It turns out that at one of the places I go, people started taking the slippers - which were hand knit and warm. This is very bad karma. When I found out about it, I said I could knit some new slippers for the place and the owner and I struck a deal. She wanted slippers for kids, aged 3-10, since those were the sizes that were disappearing. 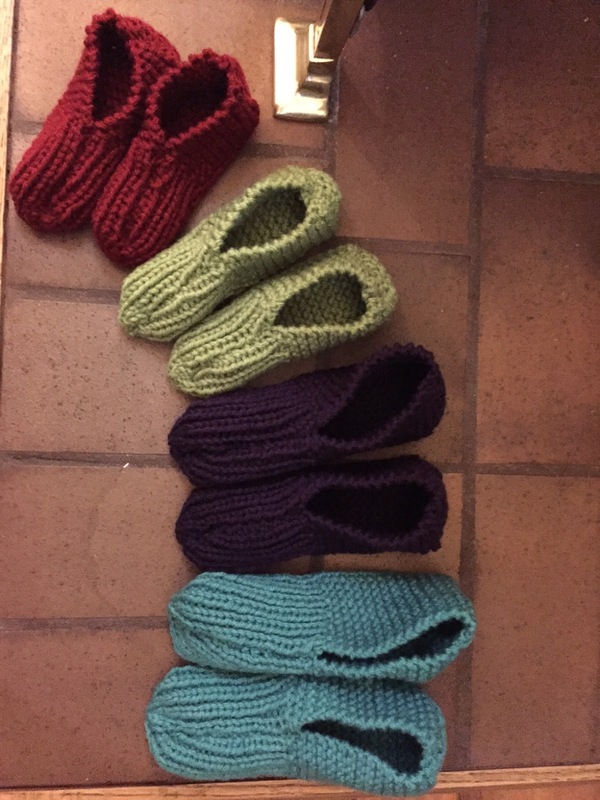 I found a pattern on ravelry.com for knit slippers for kids. It was simple enough and easy to follow and had a heel flap, which I think makes for a better fit. I figured out what sizes I needed to make and headed to Michael's for some yarn (and there was a sale on). I bought yarn called Impeccable by Loops & Threads; it's 100% acrylic with a nice texture. I choose this yarn because (honestly) it was on sale as buy 1, get 1 (total cost for materials: $7.49 and I have lots left over), they had colours I liked, it was soft and not scratchy, there was more yardage per skein than a comparable brand, and it would wear well and be easy to wash and dry (because it's acrylic). In total, I made 8 pair. Here are the smallest 4 - I forgot to get a photo of the other 4. The red ones are about 4" long, and the turquoise 7-8" long. I think they were a hit because the receptionist, who has small feet, kept a pair aside for her to wear while at work. The slippers stretch a lot, so if I was making them again, I'd go down a size maybe for a snugger fit. Anybody who saw them said their grandma/aunt/mom made the same kind - if they've been around that long, the pattern is sound.